This lovely blue and red checkerboard design was one of many creations by the late Gladys (Gary) Kreger of Casselman, Somerset County, PA. Gladys was the daughter of Jacob A. and Minnie (Miner) Gary of Kingwood, Somerset County. 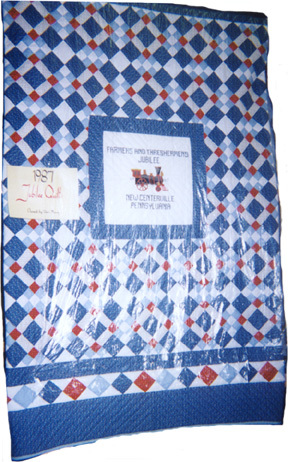 This particular quilt was displayed at the 1997 Farmers and Threshermans Jubilee in New Centerville, Somerset County, an annual event benefitting the New Centerville & Rural Volunteer Fire Company. It is covered in plastic -- hence some of the reflections you see.